Fourth day in the morning we had Kansoku-hou which is a kind of massage for feet using wood stick at Dojo. It was a painful and nice feeling somewhat, so we could let tiredness accumulated for three days go. We started the FINAL day with Meta Harvesting which made us reflect what we have learned. 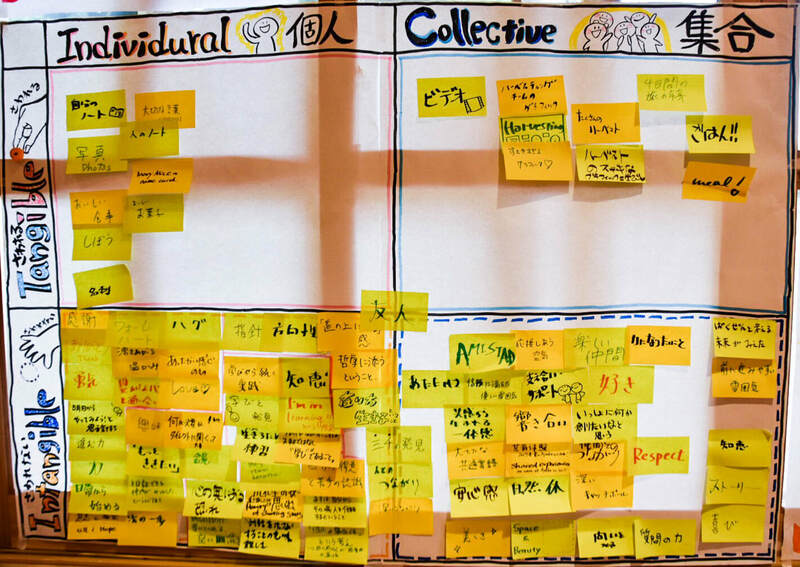 Applying the Tangible-Intangible × Individual – Collective 4 quadrant framework, we summarized what we learned, what we noticed, what we discovered and externalized mostly by writing. Everyone harvested their fruits! Next came the 8 Breaths, which is the core of core in Art of Hosting. We explored the 8 Breaths (or steps) to hold a conversation that matters. Many of us agreed that in the world there is passion, but sometimes “dialog does not work”, “action does not happen”, or “we think the process should go forward in a straight line, but sometimes we go back and forth” even if you started with CALLING to be driven by a strong urge. That’s true! Mary Alice emphasized the importance of Art of Invitation to work with such situations and prepare well and Art of Harvesting to facilitate learning and action from dialog. After sharing our gratitude for super meal team in song we went into last practice: Pro Action Café. 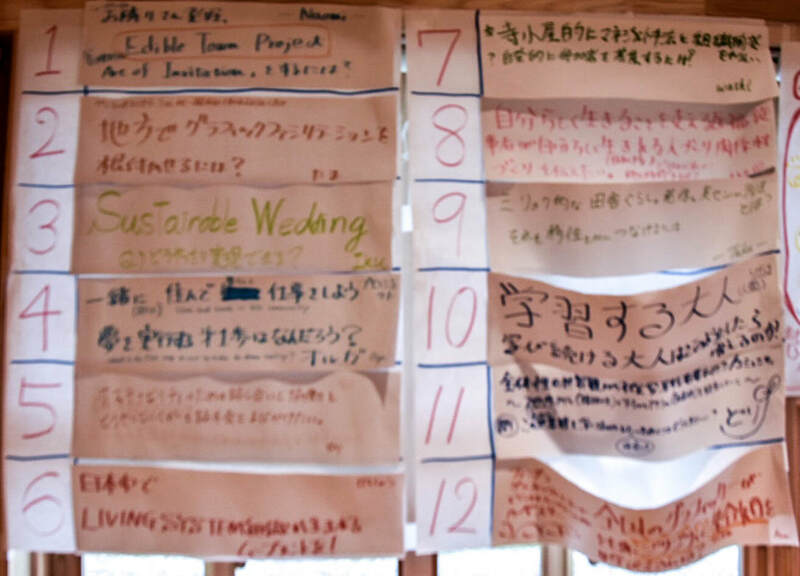 Twelve people who had a calling about something they WANT TO DO -- they had a Desire, Purpose (=Project) -- stood up and rest of participants became coaches to the project owner to support the next step of those projects. Since participants were not stakeholders of the projects, they offered many straightforward questions. 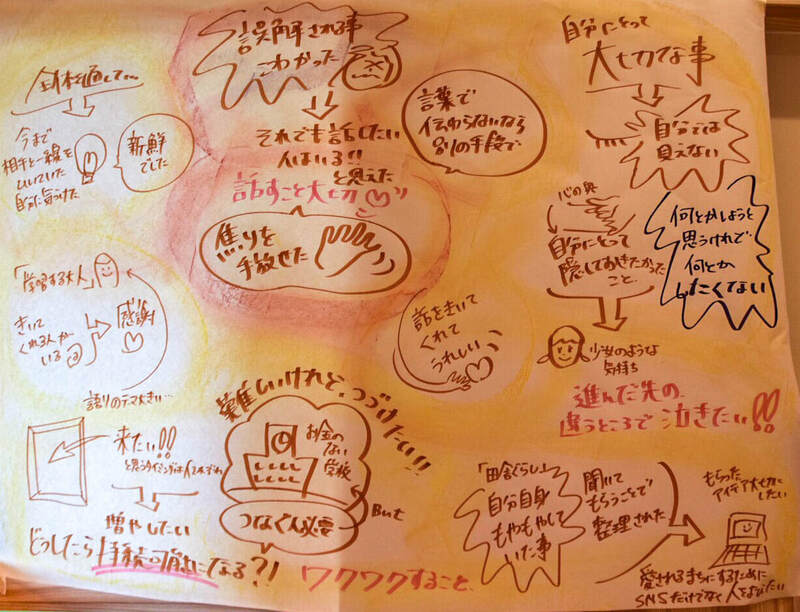 As a harvest, big decisions of life and next clear actions emerged during the Pro Action Café. Finally we were at the end of Art of Hosting Ayabe 2017. During Check Out, many volunteers wanted to share their learning and insights with all so it ended past the planed time. A lot of energy remained in Dojo we closed the breaths of 3 nights 4 days. What we are harvesting from this training?